Nature's Bounty Cod Liver Oil is a natural source of Vitamin A and D. This oil aids in promoting strong bones and a healthy immune system. 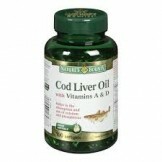 Cod Oil also helps in many other functions such as strengthening the eyesight and maintaining skin health. Take one soft gel per day with a meal. Offering the Nature's Bounty Cod Liver Oil with fast shipping in Karachi, Lahore, Islamabad, Rawalpindi, Peshawar, Quetta and many other cities of Pakistan.